Ever since I saw this giant, soft blanket in a Free People, I knew I needed one in my life. Then I peeped the price: $998. Ya, um, no thanks. I can’t spend A GRAND on a blanket. So even though this little project took a bit of effort, the 10ish hours of work and supplies still cost less than throwing down a couple hundred for a glorified sheet. Now I am not the best knitter. In fact, I basically knit once a year, if that. 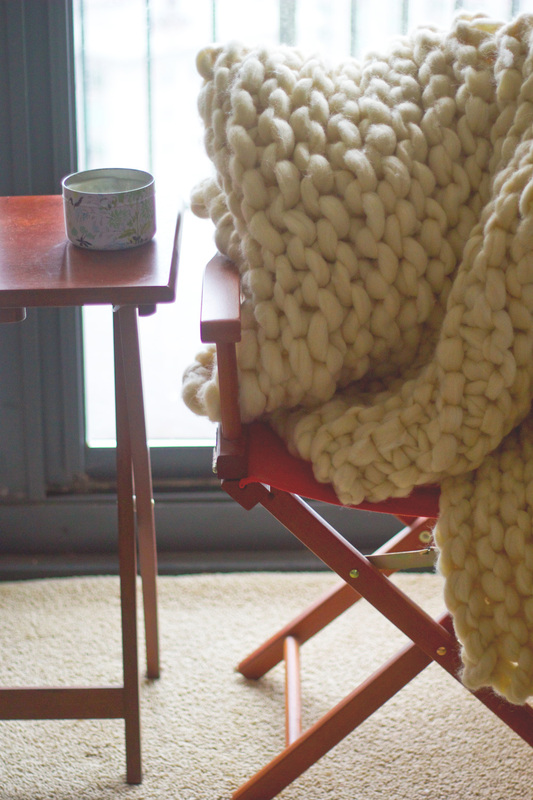 So while this blanket has it’s imperfections (all of which I embraced), I want you to know that you too can knit this giganto blanket with just a little arm muscle, some time and patience. Throughout this project I had my knitting-wiz little sister help guide me. Yes, somehow I still managed to randomly add two stitches mid-knit, but whatever. She was there to help get me back on track. If you don’t have a wonderful knitting-wiz little sis or other helpful family member, this video can help you get started. To make it easier on me and my lack-of-experience, I also went with a straight up knitted blanket, as opposed to a knit/pearl blanket, which has a sweater-looking pattern to it. 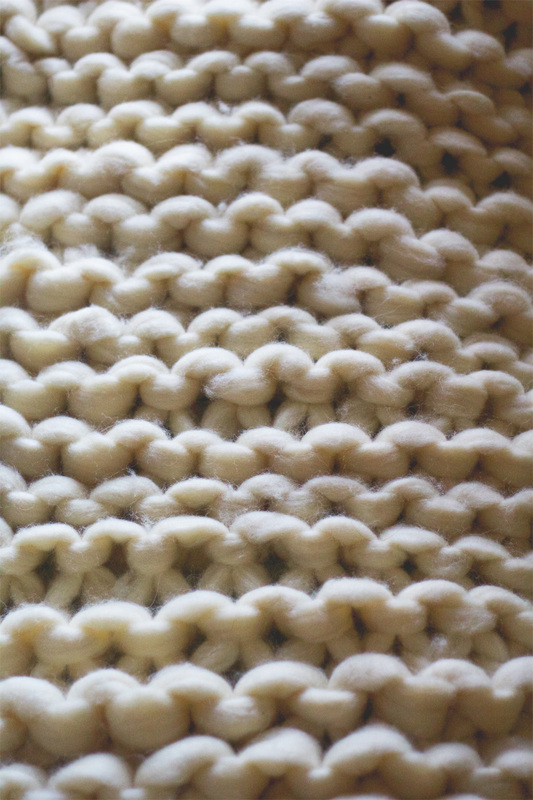 If knit/pearl is more your jam, here’s a free pattern that you can use! You can also purchase a pattern on etsy, but I was trying to spend as little money on this project as possible, since I didn’t trust myself to produce an immaculate blanket. Okay, now for doing the damn thing. I will say I followed this post which helped a ton. But I’ll break it down in my own way too, adding a few pointers I found helpful and you can decide what works best for you! 1. 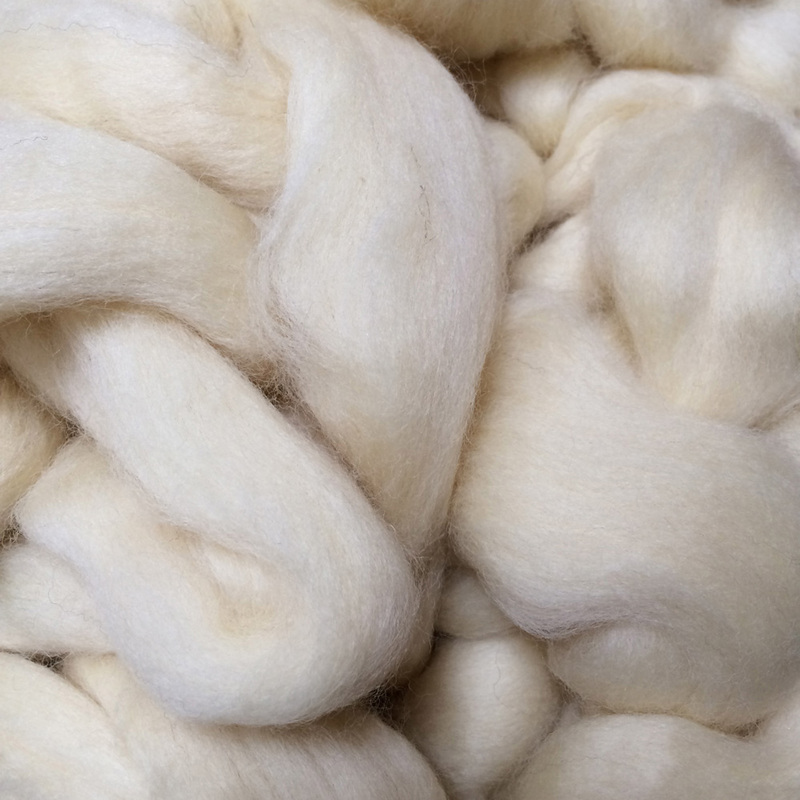 Buy 7 pounds of your wool roving. I got it from here, cuz I heart local farms and artisans. The seller will make a custom listing for you, if you request one. Total comes out to about $115 or so, after all is said and done. 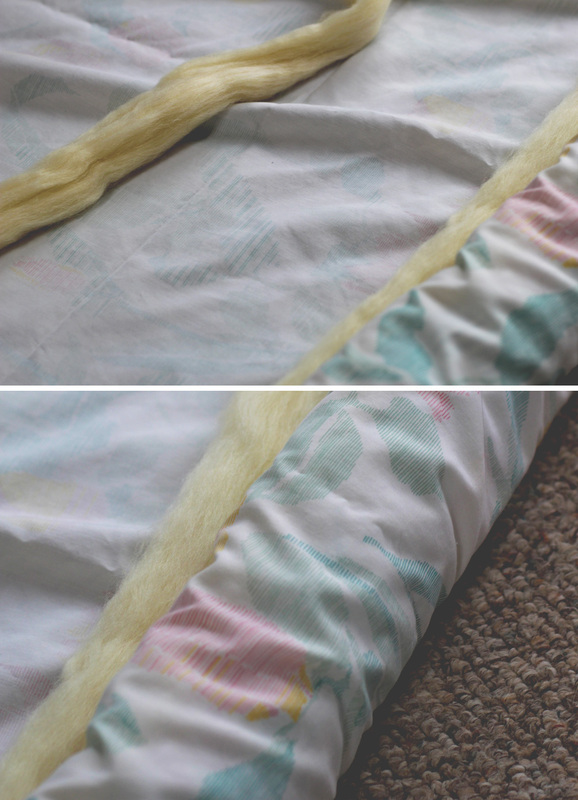 2.Once you get your wool roving, start tightly rolling it up in a bed sheet. This will help separate the strands. Use rubber bands (not the hemp I used, which will deteriorate in water–learn from me!) to secure the giant sausage-like wraps you will create. 3. Throw the “sausages” into a bathtub filled with extremely hot water. Pour a little detergent into the tub, put on your rain boots and get to squishing your sausages around (you’re basically a giant washing machine at this point). Do this for about 10 minutes, or until you are just entirely too exhausted to go on. 4. Rinse everything out. I did this by refilling up the tub, running the water directly over the sausages and continuing to stomp. I also threw them in the actual washing machine at one point to help better wring out some of the water. You can do this, but check to make sure your washing machine can handle it since this is quite a bit of heavy, wet fabric to deal with. 5. 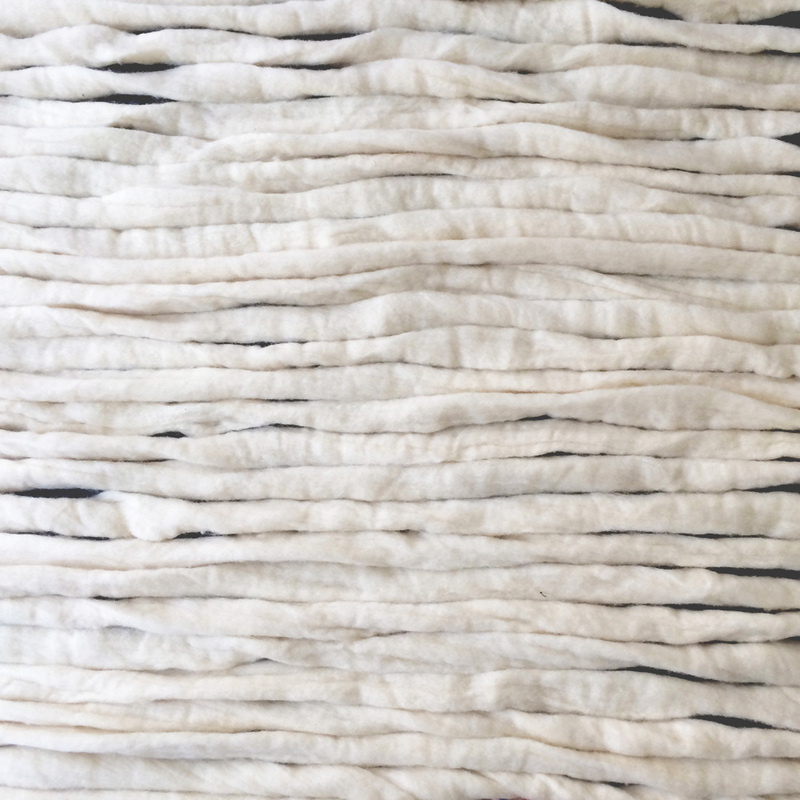 Once the roving has been rinsed out to the best of your abilities, lay out a plastic sheet (I used trash bags) and being unraveling your sausages to reveal the wool. 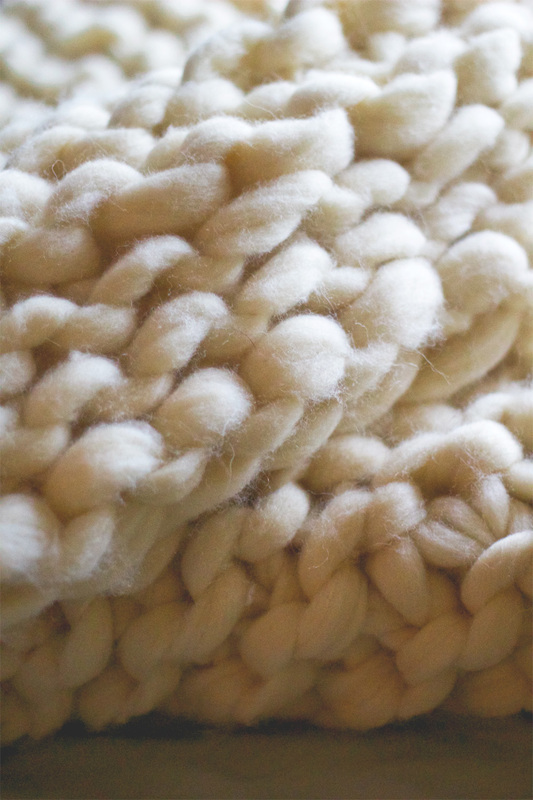 Take your tightened wool strand and lay them out to dry overnight. 6. In the morning the strands should be dry. Now it’s time to wrap them up into giant balls! Split the entire strand in half, vertically, and from those two halves, create two giant balls! 7. Enlist your favorite male figure to get you two 1-1.5 inch, 5 ft tall PVC piping. 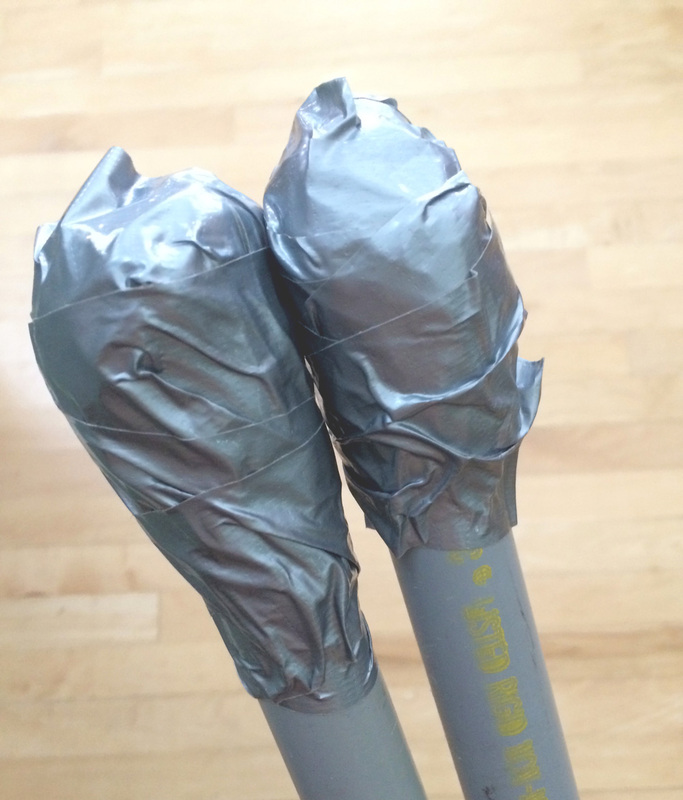 Once you get your hands on two of those babies, use duct tape (or your creativity) to fashion a point on the tip of each pipe. These bad boys are going to be your needles! 8. Now it’s time to start knitting! Like I said, I took it easy on myself and just knit, instead of doing a knit pearl situation, but it’s your call. 9. 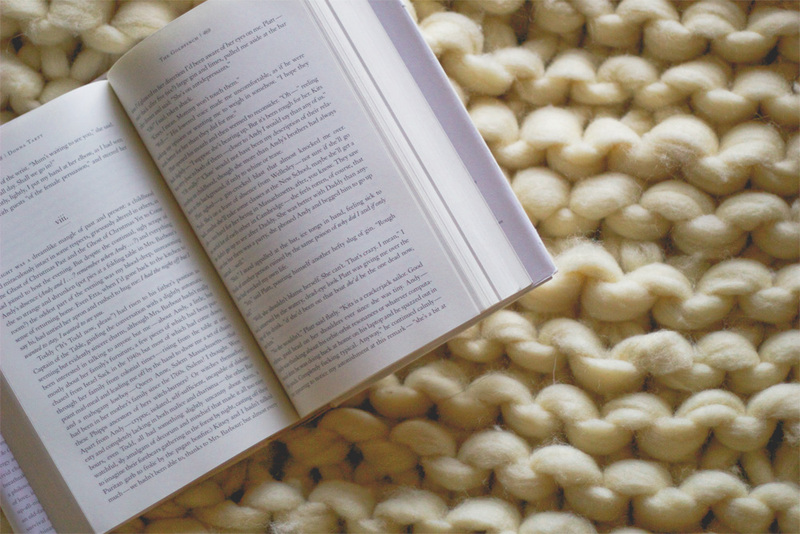 Note: Your arms are probably going to get tired knitting this blanket. It’s very heavy and large. I stood up the entire time I was knitting it, and did it over the course of a few days to give my shoulders a break. That being said, if you want to skip your weekend workout and sub this DIY project–something tells me it would not mess up your fitness regimen. It’s definitely not for the light of heart (or anyone who has arthritis). 10. But once it’s done, isn’t it so gorgeous! Oh, and it’s extremely warm. Ha! Take that Midwest Winters! You won the TOMS giveaway! No matter where this weekend takes you–boozy holiday parties or curled up in front of the fire–I hope you have a good one. See you Monday! 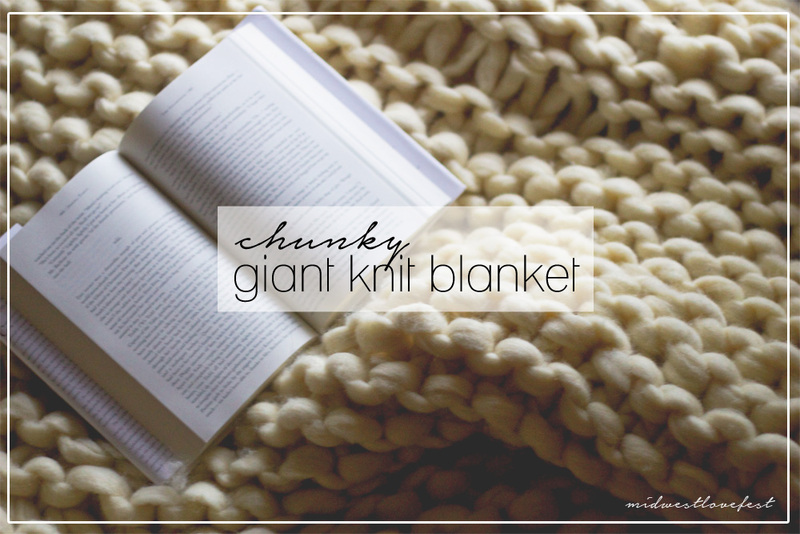 Thanks so much for the great info on the chunky blanket. 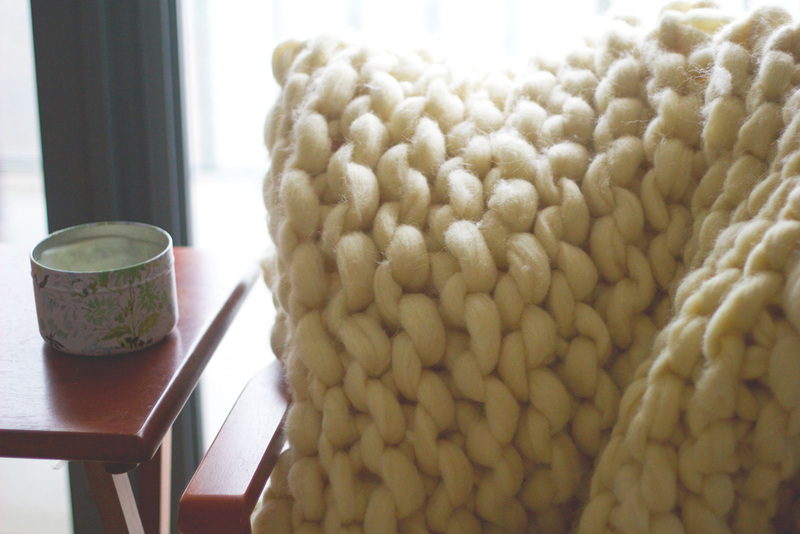 Can you tell me the dimensions of the blanket you made using 7 balls of yarn? I so want to make one for my daughter’s bed (she’s in college) but I want to know how much yarn I will need.